My mom loves Christmas cake. 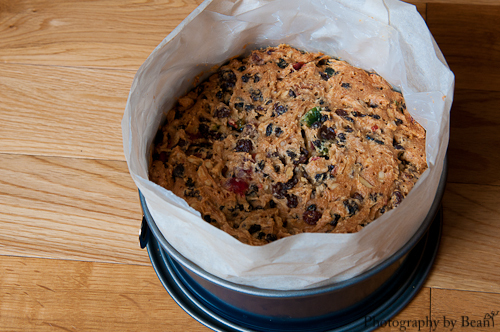 So after I discovered ghee, I have been making a version of my Grannie’s Christmas Cake for her the past few years. I’ve modified it to take out the parts I don’t like and to make it a bit (emphasis on the bit part) healthier than the traditional version. First, I have removed the candied citron peel as ain’t nobody got time for that (aka. it’s gross). Then, I replaced some of the usual candied fruit for unsweetened dried fruit. Third, I douse it in way more brandy than the original recipe called for as it needs to stay moist of course! Preheat oven to 250F and place a bowl or pan full of water in the oven. In a large bowl, combine all the dried fruits. Add the starch and toss until the fruit is covered, breaking up any clumps. In a stand mixer, cream the ghee and sugar. Add the brandy and mix until combined. Sift in the flours and beat until a smooth batter forms. Remove from mixer and stir in the dried fruits until fruit is evenly distrubuted in the batter. Scrape in lined pan and smooth out. Bake for 3 hrs or until an inserted toothpick comes out clean. Remove from oven and let cool on a rack. Don’t remove from the pan. Once cool, take a toothpick or other thin pointy object (I used one of those turkey skewers) and poke holes all over the cake. Take a 2 -3 tbsp. of brandy and pour over cake. Place cake in a ziploc bag. Repeat a couple times over the next few days. The cake can be stored on the counter for a few days on the counter and longer in the fridge. It freezes very well, just make sure you brandy it at least twice and wrap in two ziploc bags. Are you a Christmas Cake lover or hater? Rebekah has tons of delicious recipes, many of which Mr. Bean asked me to make: BBQ Chicken Salad with Cornbread Croutons, Crockpot Shredded Beef, Party Beans, Gourmet Mushroom Risotto and Perfect Summer Sandwich. She has a large selection of baked goods, but I was visiting Mr. Bean in Red Deer for the weekend, so I had no access to my usual baking and gluten free flour supplies. 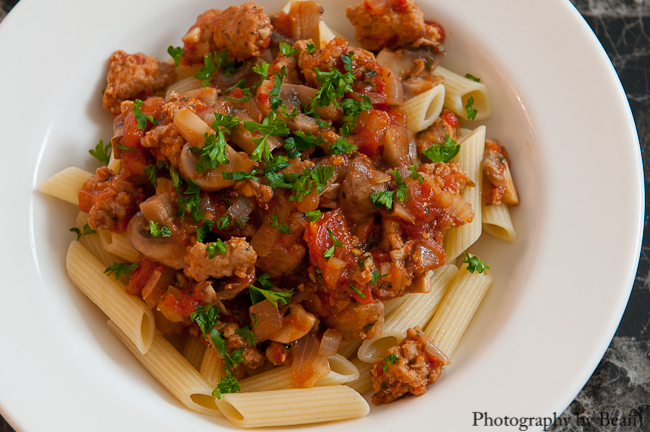 I chose her Mushroom Sausage Ragu and it did not disappoint! 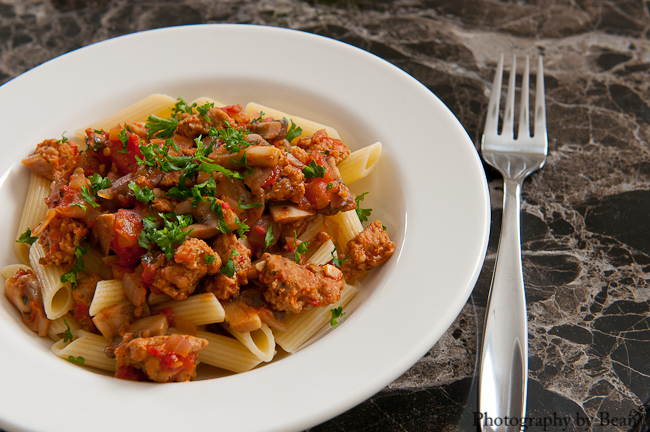 It was fairly simple and very delicious, making it a perfect dinner. We ended up making about double her original recipe, which made excellent left overs. Remove sausages from skins, break into pieces and fry up until browned in a large skillet. Remove from skillet into a paper towel lined bowl. Wipe out skillet. Add oil to skillet and sauté onions and mushrooms until onions are soft and mushrooms are cooked through. Add garlic and sauté for a minute. Add diced tomatoes, Italian seasonings and salt and pepper. Simmer until most liquid starts thickening up. Add more liquid if desired. Meanwhile, cook pasta according to instructions. 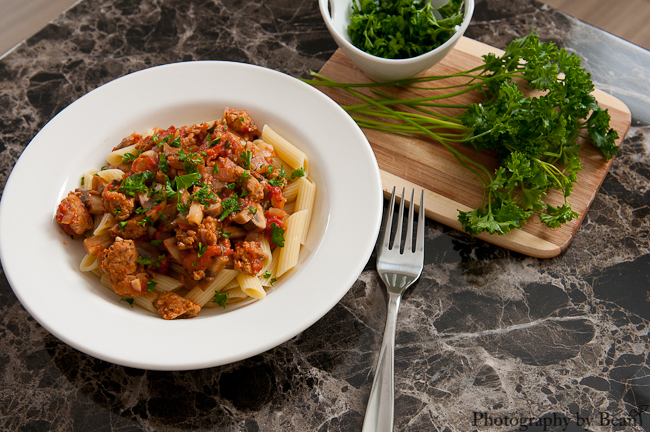 Serve Ragu over pasta and sprinkle with chopped parsley. Please check out the rest of Group D’s recipes by clicking the link below! For October’s Secret Recipe Club, I was paired with Amy of Fearless Homemaker. Amy lives in Nashville, has a super cute daughter and tons of cute aprons! Amy has TONS of delicious recipes like Bacon-Wrapped Manchego + Mango Chutney-Stuffed Dates, Brussel Sprouts with Pancetta and Garlic, Bete Noire (Flourless Chocolate Cake), Peanut Butter Chocolate Chip Bars and Chocolate Avocado Pudding. 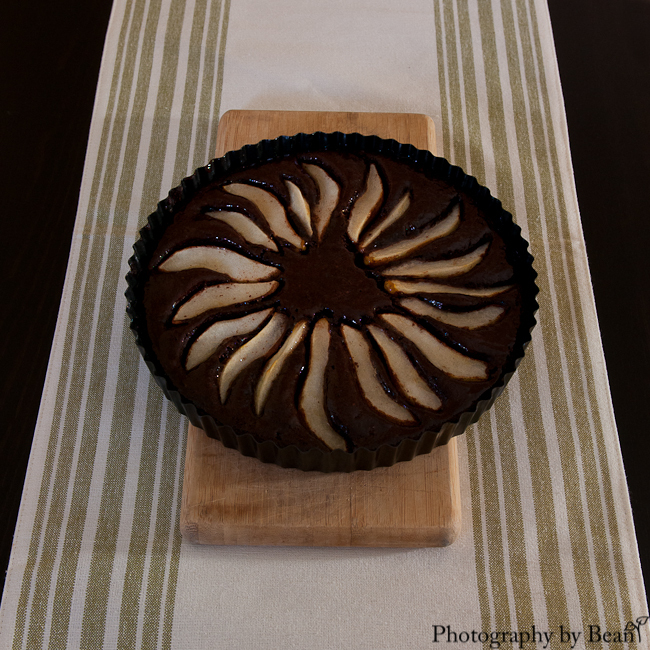 I also made her One Pot Tomato Basil Chicken Pasta but didn’t have the opportunity to take photos, so I also made her Chocolate Almond Pear Tart. 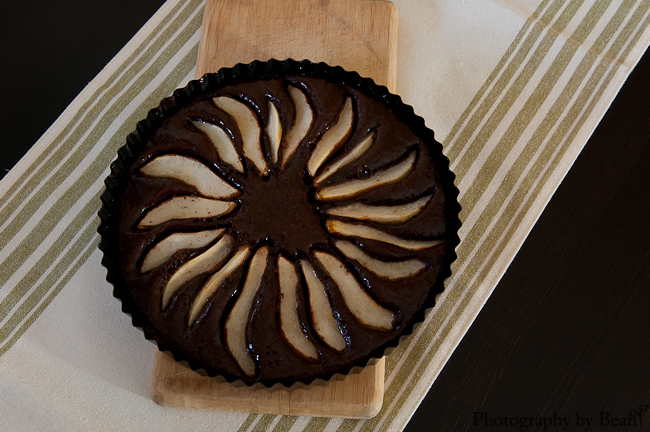 The tart turned out really well and in my not-so humble opinion, is a perfect fall dessert! Mr. Bean kept commenting how good it smelled while I was making it and while it was baking and the end product definitely didn’t disappoint! It was super tasty and had a perfect light texture! Since it’s naturally gluten free, I only made a few modifications. I used almond flour instead of grinding whole blanched almonds and reduced the amount of sugar to 2/3 c. from 3/4c. Preheat oven to 350F. Grease a 9in removable bottom tart pan with margarine. In the bowl of a mixer, mix together the almond flour and sugar. Add eggs, margarine, cocoa powder and vanilla extract and beat until smooth. Scrape into tart into pan and smooth out. Peel pears and cut into 12 pieces. Rub with lemon juice to prevent discolouration. 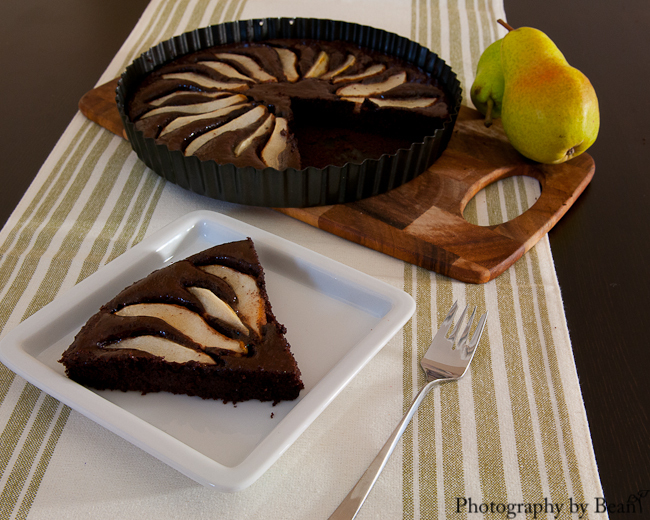 Arrange pear slices on chocolate mixture, so they slightly overlap. Don’t press in. Place on baking sheet and cook for 45-50 minutes until tart is puffy and a toothpick inserted into the centre of the chocolate mixture comes out with only a few moist crumbs. Let cool completely. Heat jelly in microwave or stove until liquified. Gently brush pears with jelly. Let set for at least 20 minutes. Remove tart from pan and serve. What is your favourite non-pumpkin fall dessert? 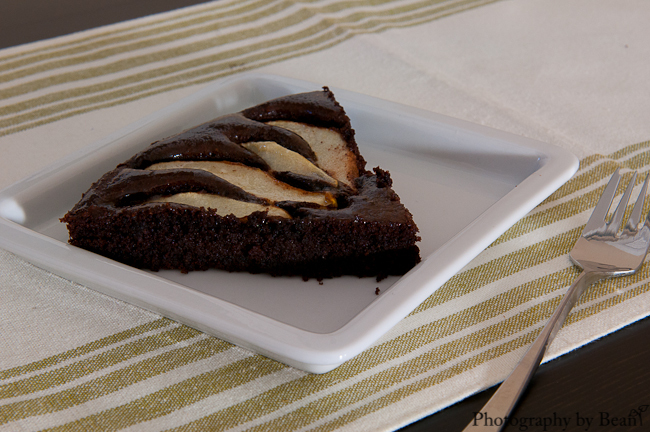 For August’s Secret Recipe Club, I was paired with Sue of Palatable Pastime! Sue has tons of amazing recipes like her Autumn Apple Nog, Lebanese Red Cabbage Salad, Asparagus with Crispy Garlic Proscuitto and Bubble and Squeak. 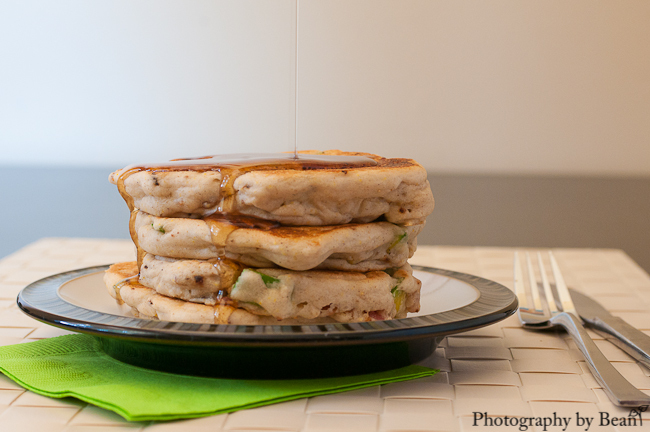 I chose to make her Avocado Bacon Pancakes with Maple Syrup! She has a few different recipes with the avocado/maple/bacon flavour combination, like her maple bacon guacamole, all inspired by some avocado toast with bacon and maple syrup! I was a bit skeptical at first, but the flavour combination worked out pretty well! 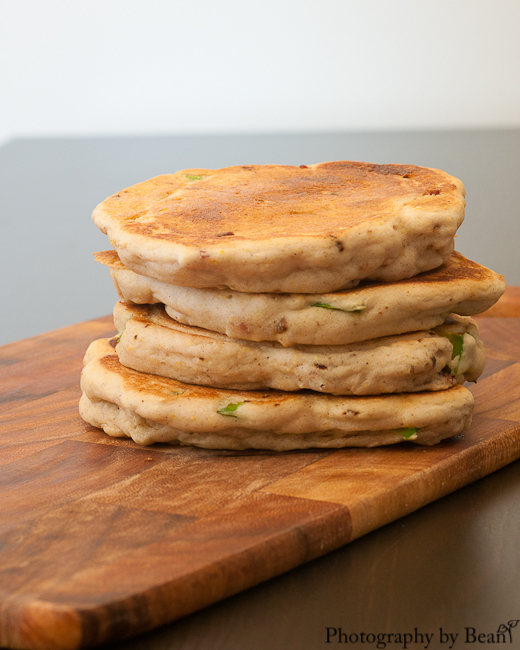 I made a few modifications – I made the pancakes gluten and dairy free to make them more “me friendly”. My avocado wasn’t as ripe as I would have liked, but it still worked. 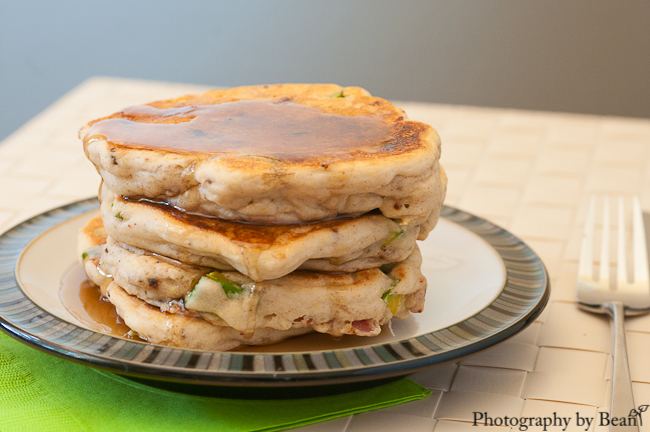 This recipe makes 6 pretty thick pancakes. They had good texture and weren’t dry at all! Preheat griddle to 350F and lightly oil (A bit of oil on paper towel). Measure out almond milk and add vinegar to create buttermilk. Stir and let sit for a few minutes. In a small bowl, whisk together flour and xanthan gum. In a separate bowl, whisk together “buttermilk”, oil and egg. Add sugar, baking powder and salt and whisk until combined. Add flour and bacon bits and stir until batter is smooth. Fold in avocado pieces, being careful not to mash them. Scoop out 1/2 c. batter onto griddle for each pancake. (Sue recommends to lower griddle temperature at this point, but I didn’t and they still worked out fine.) If pancakes need to be sculpted on the griddle, add more milk so the batter is thin enough to flatten out slightly itself. When pancake forms bubbles on top and you can get a spatula beneath without trouble, flip the pancake and brown the other side until the pancake is springy but firm to the touch. Enjoy warm with dairy free margarine (butter) and lots of maple syrup! For July’s Secret Recipe Club, I was paired with Becky of A Calculated Whisk. She also cooks gluten free (and paleo), so I was was spoiled in my options and with the eye candy of her beautiful photos! Becky also loves putting avocados in smoothies, Salted chocolate hazelnut cookies, Mexican almond pulp brownies, Vietnamese caramelized pork meatballs vermicelli bowls and Pico de gallo de frutas. I had a few avocadoes on my counter and some fresh basil that needed using up, so I ended up making her avocado cilantro pesto pasta salad. 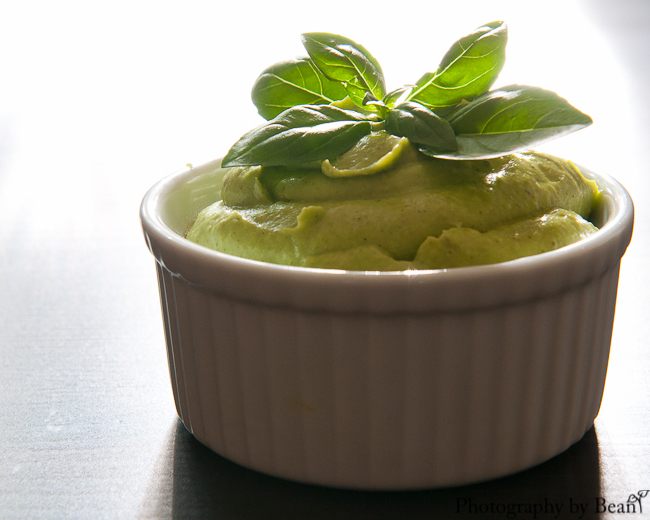 I did modify the recipe as I had basil to use up, so I replaced the cilantro in my version. I added garlic because what pesto is complete without garlic? I used my single serve blender instead of a food processor as it’s much easier to clean. I think pestos are supposed to be chunkier, but I blended mine smooth. I used hemp hearts instead of the feta as I had it on hand and I try not to eat a lot of cheese. I tried it both warm and cold and I prefer the cold version of it. 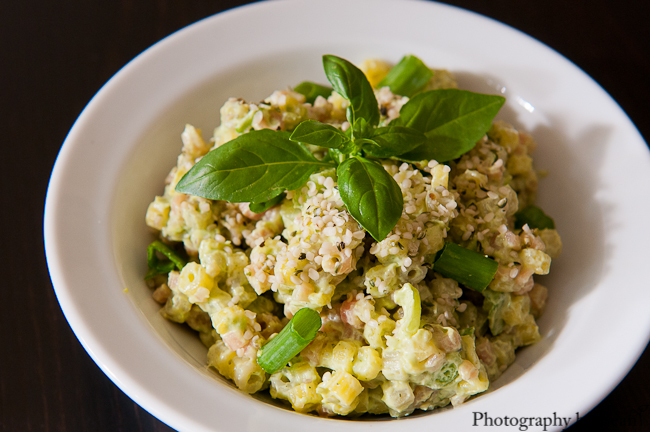 It goes very well with barbecued meat, making this the perfect healthy summer side dish! Mr. Bean and I liked it so much we are definitely adding it into our repertoire! 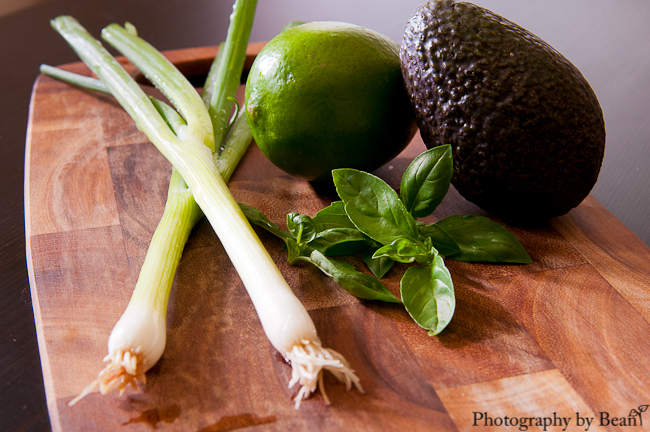 In a food processor or blender, blend together avocados, lime juice, olive oil, garlic and basil. Once smooth/to the desired degree of blendedness, add 1/4 c. of hemp hearts and blend. 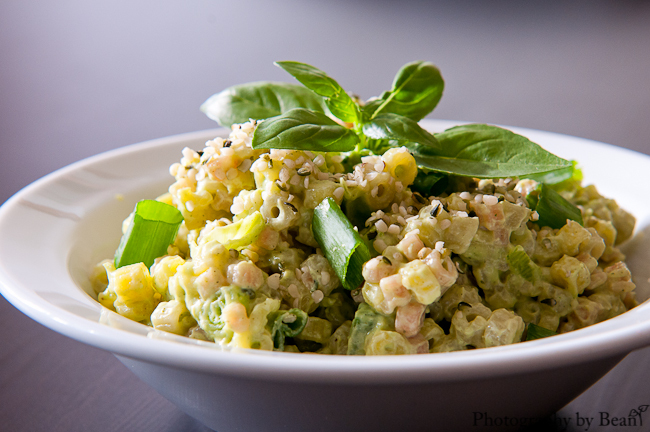 Pour pesto over pasta, adding green onions, peas and remainder of the hemp hearts. 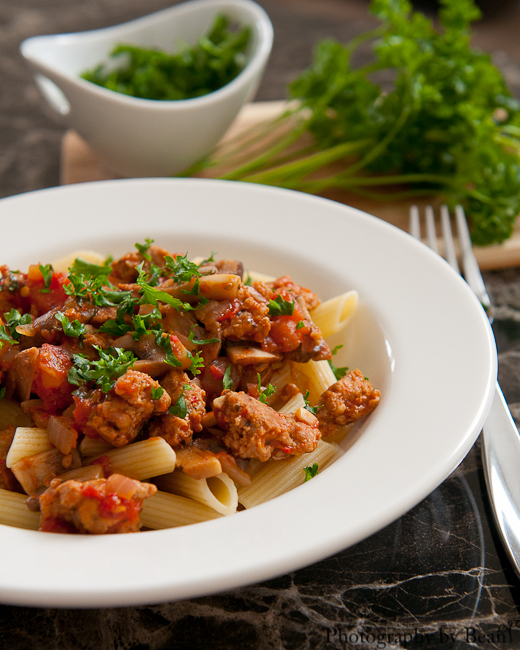 What’s your favourite summer pasta? 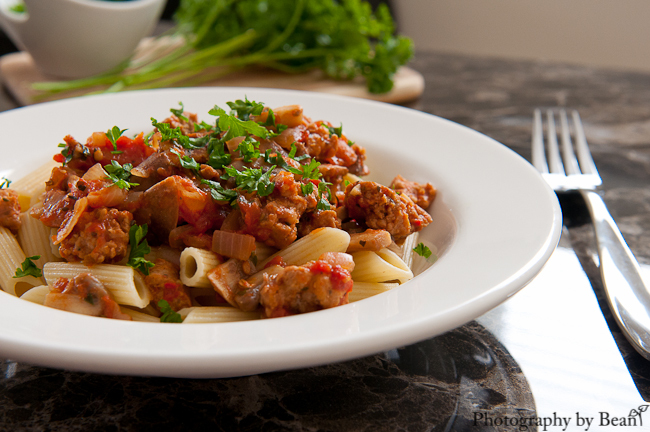 For the rest of Group D’s recipes, please click below!